A beautifully eye-catching mens lace-up brogue shoe - the Dennis from Justin Reece. Today the amount of detail that goes into the Justin Reece shoes is incomparable to your simple brogue. British traditional silhouettes are taken and produced in an original way, to stand out and draw attention for all the best reasons. The amount of detail is only noticeable when each shoe is held up and adored; the leathers used are none but the best even down to the shoe laces, made from the finest cotton. 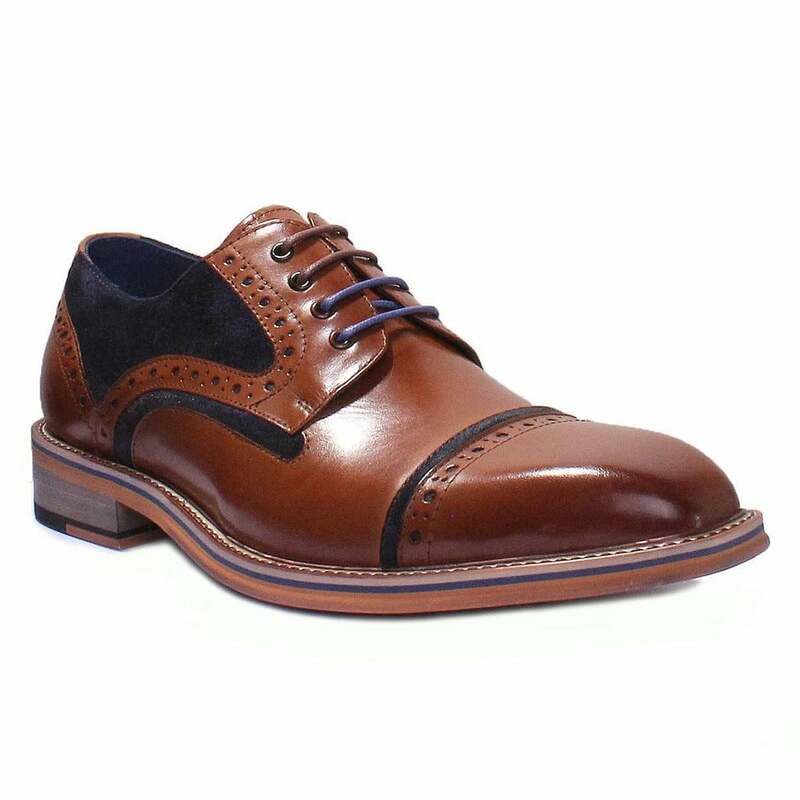 This mens lace up brogue shoe from Justin Reece has been finished in a stunning high shine dark tan brown leather with contrasting distressed, dark navy suede leather panels that curve and flow along the traditional brogue detailing. Fastening the Dennis wingtip mens brogue from Justin Reece are contrasting narrow brown coloured laces, through four pairs of ring eyelets over a flexible tongue and for that extra attention to detail the Justin Reece Fred mens brogue also comes with navy laces so you can choose which of the two colours matches your unique and sophisticated style. Inside, the Dennis mens brogue is lined with soft navy blue leather and carries the Justin Reece branding on its lightly padded insole. Justin Reece takes pride in the use of none traditional colours, but still uses a traditional British method of producing his shoes and good year welting give the shoe longevity. For a mens shoe that doesn't compromise on quality, finish or style, the Justin Reece Dennismens brogue shoes are perfect when you need to dress for that special occasion but are versatile enough to look good with your jeans and more casual attire - get your pair today!